During the fall of 2014, Lance Estep, a member of the Arkansas Archaeological Society and student at Missouri State University, was given the opportunity to conduct an independent study of Hogscald Holler near Eureka Springs for his Advanced Methods in Archaeology course. He worked in conjunction with the Arkansas Archaeological Survey and reported monthly to Dr. Jamie Brandon, head archeologist of the Fayetteville Research Station. My father passed away in the fall of 2010 and I inherited a trunk of old photos and documents — things that could have just as easily been thrown away. One of those was an army-journal-turned-family-scrapbook written by my great-great grandfather, Reverend William Martin Weatherman, Jr. The old ledger was a real curiosity with 140 pages of newspaper clippings, soldier poems, doodles, church programs, obituaries, sermon notes — and even hourly weather information for the entire year of 1891! 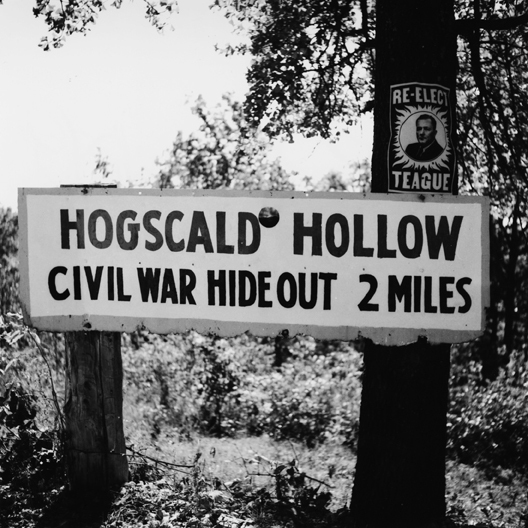 Growing up, I never knew much about my great-great grandpa except that he had been shot in the face during the Civil War, grew a long beard to hide the scar and that he was a traveling “sin-buster.” Within minutes of searching online, I came upon dozens of stories about him — and his connection to a place called Hogscald Holler. I contacted a member of Ancestry.com who had the Weatherman family tree, only to learn she was a cousin! In the spring of 2011, I met her 80-plus-year-old brother in Clifty, Arkansas. He has heard my great-great grandfather preach at Hogscald Holler and he showed me how to get there. Peek-A-Boo Falls in Hogscald Holler. Because the falls no longer run, they have been largely forgotten. Author Lance Estep rediscovered the location since beginning site stewardship. 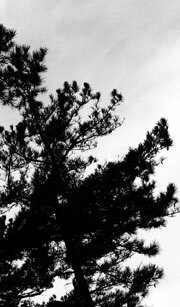 Upon witnessing the other-worldly beauty and serenity of the place, I became concerned about its well-being and future. Just a few hundred yards beyond the old church grounds, there was graffiti, broken glass, beer cans, rusty fish hooks and worse. I vowed to do whatever it took to protect this place and others like it. I returned to Missouri State University — after a 20-year absence — to study archeology and joined efforts with the Ozark Regional Land Trust (ORLT) as they had set up 10 acres of Hogscald as a nature preserve. Over a four-month period, I amassed 355 pages of historic photos, news articles and maps. I wrote another 100 pages of detailed notes and spent nearly 200 hours doing on-site survey work. I met several cousins and made many new friends, including Jim Two Feathers (a Muscogee-Creek-and-Cherokee Indian), who lives there. Hogscald Holler derives its name from a short section of creek bed with rare depressions variously called potholes, scalds, vats or kettles. Early European pioneers used these natural “kettles” in which to scald razorbacks — or wild Russian boars — that had been introduced to Arkansas by Hernando De Soto in 1541. By the 1850s, thousands of hogs ran wild in the countryside. Soldiers diverted cold spring water around the kettles by building small rock dams. Then fires — outlined with rock — were built beside the holes. Once the adjacent stones were hot, they were kicked into the holes, thus heating the water to scalding temperatures. 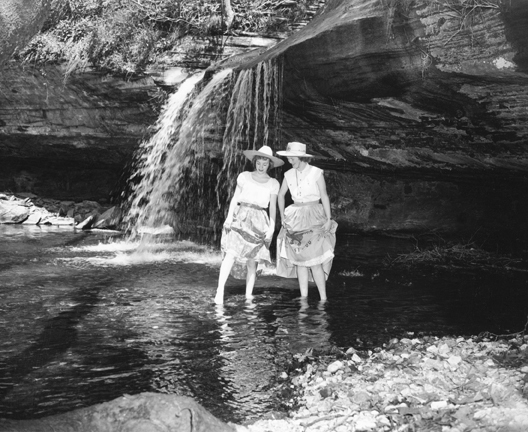 Fred and Ethel Todd, authors of Clifty and the Two Hillbilly Kids Growing Old, note the temperature was just right when “the water was too hot to dip your finger in more than twice.” Just below Hogscald Falls is Dead End Canyon, an ideal place for corralling animals. After the corralled razorbacks’ throats were cut and they were bled out, the animals were scalded in the creek to loosen the hair and prepare the carcasses for butchering. 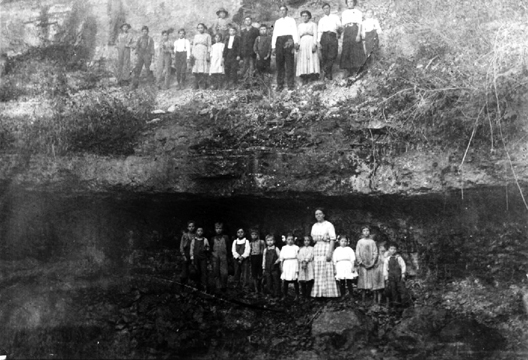 Two of the holler’s rock shelters later served as a brush-arbor-style church yard from 1880 to 1930. A two-story stone outcropping known as Preacher’s Rock was chosen as the pulpit. The shelter below the rock served as a choir “loft.” The congregation sat in the opposing shelter. Bluff Church, it was called. Wild ferns and flowers adorned this church yard. With the tumbling chorus of Auger Falls, melodic songbirds and the scent of honeysuckle thick in the air, it seems an experience with the almighty Creator was all but inevitable. The place is so beautiful it is little wonder why folks would travel for miles every week to hear Reverend William Martin Weatherman, Jr. — my great-great grandfather — preach from the Good Book. The Sonora Correspondent reported, on August 21, 1903, a gathering of 700 for one of his sermons. My great-great grandfather was born near Terre Haute, Indiana, on July 8, 1846. , He joined the Federal Army on November 18, 1861, at the tender age of 14, and served in Company G of the 57th Indiana Preacher Unit. He survived 10 of the bloodiest battles of the Civil War, including Shiloh, Stones River and Chickamauga. In the Battle of Franklin, Tennessee, he was shot in the face by a musket during General Hood’s infamous picket charge. A large portion of his lower jaw was blown off and he was left for dead. Regaining consciousness, he overheard a conversation between the field surgeon and the commander of the day. “Leave him be. This man will soon bleed to death.” Weatherman belly crawled to a dead wagon, tying himself to the rear bumper. Thus he was dragged for hours before soldiers noticed him. Placed him in the wagon’s front seat, he woke up long enough to tie a handkerchief around his jaw before passing out and falling backwards into a pile of his dead comrades. At a field hospital, doctors sewed up his face with a rusty needle. The cannons boomed around him as he lay near death. By the time General Hood surrendered, Weatherman had developed gangrene. One of the sawbones took a red-hot poker and seared out the infection. William then contracted measles. Against all odds, he survived. In 1873, he was ordained in Kansas. 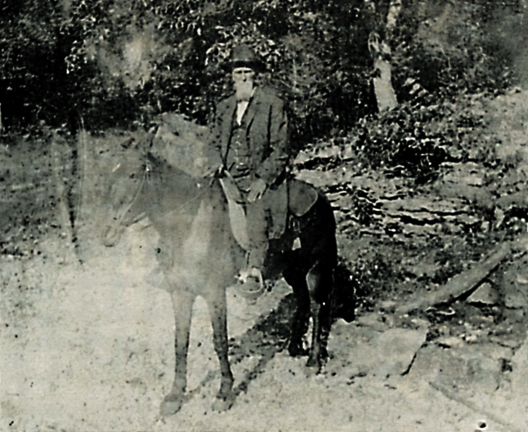 In the fall of 1874, he fled the Grasshopper Plagues and settled in a corner of Madison County in what is today Clifty, Arkansas, building a log cabin on the Madison-Carroll County line. The home stands today. 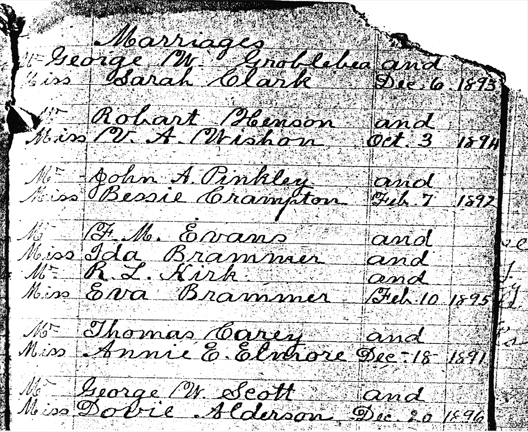 Eureka Springs marriages performed by Reverend Weatherman. My great-great grandfather Weatherman was a non-denominational traveling minister who — for more than 60 years — met appointments in Indiana, Illinois, Kansas, Oklahoma, Missouri and Arkansas. A meticulous record-keeper, Weatherman noted he led no less than 2,000 souls to Christ. He joined the United Christian Missionary Society in 1920. His ledger also shows he made no more than $200 during his decades-long ministry. He preached — not for fortune or fame in this world — but for future rewards in heaven. Rev. 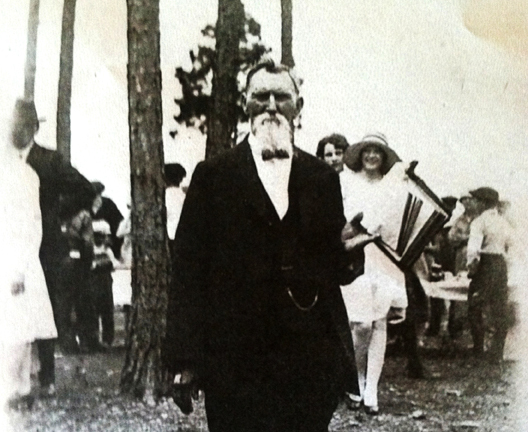 Weatherman at Lone Star Church in 1927, photo courtesy of Keith Bennett. Once, the people asked if they could remain on their horses until the baptism as the snow was too deep for many to navigate! Rev. Weatherman astride his horse. Weatherman kept appointments in six states for over 60 years. 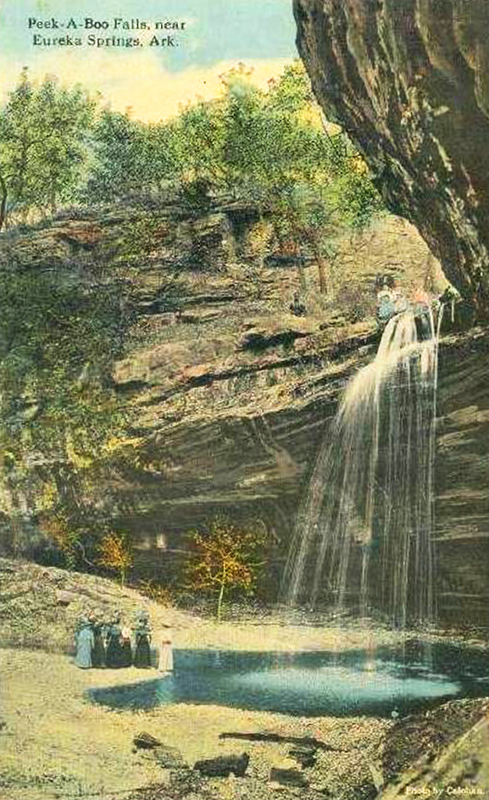 As Eureka Springs grew from a small camp into a thriving city, Hogscald Holler retained its importance. 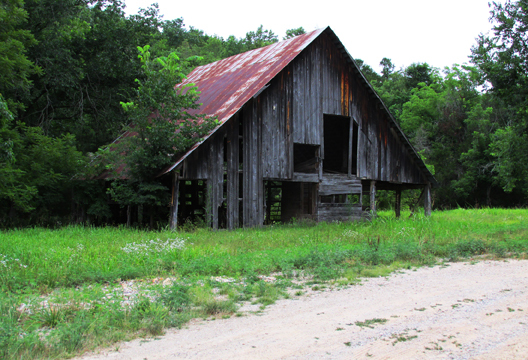 The holler was known for its bee trees and the nearby valleys were full of sorghum mills. Pumpkin patches covered numerous hillsides. Honey hunting was a regular pastime for the residents of Carroll and Madison Counties while the pumpkins cultivated at Hogscald were said to grow to mythic proportions. 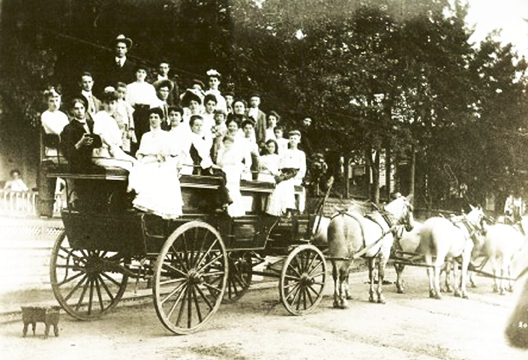 From 1886-1906, the Crescent Hotel provided guests with daily tally-ho rides to Hogscald. Writer Otto Ernest Rayburn said some of the real old timers asked if he had heard about the giant iron kettle once made in Eureka Springs. They told him it was so large the men hammering on one side couldn’t hear the men hammering on the other side! Trying to play cool, Rayburn asked what such a kettle was for. “Why, to cook them punkins from Hogscald, of course!” came the reply. Adjoining Hogscald is Durham Mill Hollow. This hollow has a large cave with walls — according to multiple sources — covered by petroglyphs carved by the Ancient Ones: the Ozark Bluff Dwellers who came before the Osage, Quapaw or Caddo. It is likely saltpetre-rich soils from this cave were mixed with privy waste and charcoal to produce gunpowder during the Civil War. During the 20th century, however, the cave entrance was pushed in with a bulldozer, sealing its secrets from the outside world. To the southwest of the cave was Durham Mill. A three-story undershoot mill, this regular stop for the Butterfield Overland Stage became an important asset for the Confederacy. But before the war, the mill owner was in cahoots with a group of bandits who hid out in the cave. The millwright would offer travelers free lodging in the millhouse but after dark he would alert the bandits who would close in for an easy robbery. It took awhile but the law showed up and a shootout occurred near the cave. All the outlaws were captured, executed and buried in unmarked graves on Samuel (or Sandstone) Mountain, roughly two miles south. The Durham Mill operated until 1940. Today, very little remains of the structure. 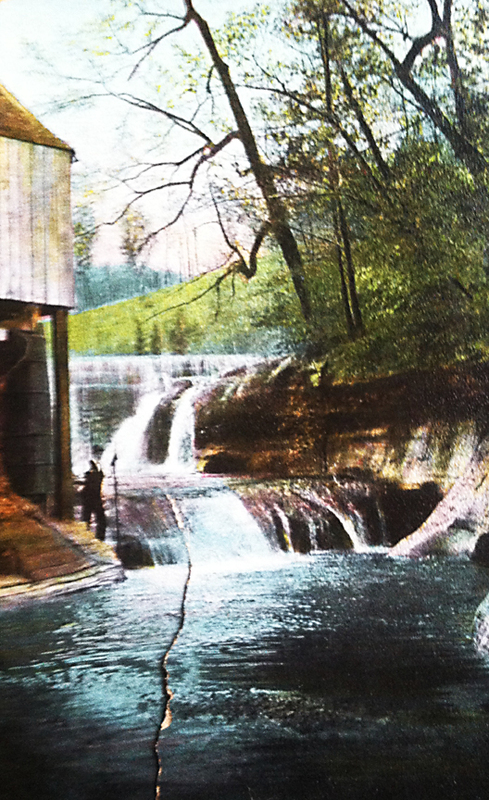 A real color postcard of Durham Mill (simply titled “Old Water Mill Near Eureka Springs, ARK”), ca. 1910 - 1915, photo courtesy of Sue Oliver. Just beyond the mill race is a series of deep holes much like scalds. However, these holes are more than 20 feet deep on occasion and are always covered by the creek. Due to the depth and clarity of the water, the holes have a deep bluish hue. A popular swimming spot for years, the area beyond the mill race is simply called Blue Hole. Hogscald Holler has even inspired its own folk tales. Truly grim fairy tales were necessary in those days in order to frighten children away from the dangers of the forest. The Arkansas hills were teeming with bears, panthers, razorbacks, copperheads, cottonmouths and rattlesnakes. From a bluff or sinkhole edge, a single misstep could plunge an unwary child hundreds of feet onto boulders below. Even adults had to be careful. According to a story told by my cousin, Keith Bennett, Dave Prickett was working a sorghum patch above the Durham Mill Cave when a portion of the cave ceiling collapsed beneath him. Prickett drove his team right off into the cave! Luckily, neither he nor his horses were killed. One day, a local farmer shot Raw Head and scalded him in Hogscald Holler. The witch used her magic ball to find her beloved animal and brought the pieces back to life. “Bloody bones, get up and dance!” she chanted. Lightning struck the hog’s body and his bones came back together. She used magic to give Raw Head the claws of a dead bear, the teeth of a dying panther and the tail of a rotting raccoon whereupon Raw Head sought vengeance on the farmer. Finding him on the road, Raw Head chased him back to his farm, cornering him in the barn. This ca. 1850 barn at Hogscald may be the very barn mentioned in the tale. Photo by Lance Estep. “Land O’ Goshen!” exclaimed the farmer. “What is that bushy tail for?” Raw Head hesitated for just a moment and then screamed, “To sweep your grave!” pouncing on the farmer. Still, the man was able to get away, jump on his horse and ride pell-mell into the dark forest. However, Raw Head knew the woods better than the old farmer and he raced ahead, cutting him off at a narrow bluff. Leaping upon the farmer, Raw Head sliced the farmer’s head clean off and then rode through town upon the horse, holding the farmer’s head high above for everyone to see. It is not hard to see the influences of well-known folktales such as Little Red Riding Hood and even Sleepy Hollow. Fayetteville folk duo Still On The Hill (Donna Stjerna and Kelly Mulhollan) even wrote a song about the legend in 2013. Inspired by the region, Still On The Hill have also wrote Once A River (inspired by my great-great grandfather) and Bluff Church, (recalling the baptism of a young girl at Hogscald). Through Stjerna and Mulhollan, I was introduced to Ed Stilley, an Arkansas legend in his own right and the subject of several books. Stilley was born at Hogscald in 1930 and he is known for building hundreds of guitars from commonplace objects and giving the instruments away to children. Stilley shares a common thread with my great-great grandfather as Stilley also preached and baptized people. Raised by Fannie Prickett in a little house just above the scalds, Stilley grew up knowing that making a living was tough and folks had to be creative to survive. 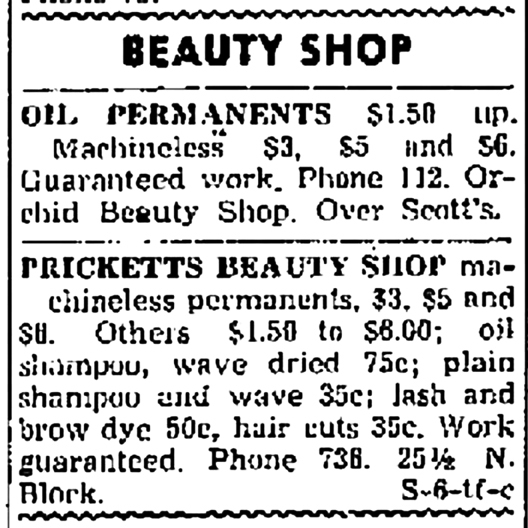 Fannie Prickett ran a beauty salon in Eureka Springs. Stilley sold fresh eggs and helped out on farms. Digging up nightcrawlers was free so in the 1950s, Stilley turned his chicken house into a bait shop for fisherman on the White River. Beaver Dam impounded the White River in the 1960s creating Beaver Lake and so Stilley’s barn became the Hogscald Hotel. Today, the original chicken house/bait shop and barn/hotel serve as a residence for the Hall family. 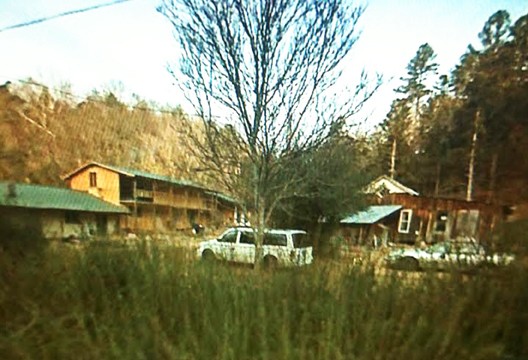 From left to right: chicken coop (bait shop), barn(hotel), Ed Stilley house. Over the decades, the serenity and mystery of this spot has attracted prominent authors and artists as well, including Vance Randolph, Glenn Swedlun, Louis Freund, Helen Long Bittick and Ernest “By Golly” Schilling, in addition to the aforementioned Cora Pinkley-Call and Otto Ernest Rayburn. A vintage moment in Hogscald Holler. Photo courtesy of the Eureka Springs Historical Museum. My work with Hogscald Holler is two-fold. As a site steward for the ORLT, it is my job to remove trash, document wildlife and keep in touch with the area's neighbors. As an archeologist, I’ve been able to document enough artifacts —without ever sticking a shovel in the ground! — to assign reliable dates to many of the site’s features. One square mile is now protected as an archaeological site. The Hogscald Nature Preserve lies at the heart of this site. This article will surely pique the interest of many who read it. However, I must warn all that camping and campfires are not allowed at Hogscald. Hunting is a major violation and is not tolerated by the Arkansas Game & Fish Commission (which is currently offering a $7,500 reward for information leading to the arrest of those involved in the killing of a bald eagle there this spring). Also, Hogscald is a dangerous place with a high population of copperheads and cottonmouths. Brown bears have been sighted and neighbors of the preserve report hearing big cats recently. Because the site is protected, artifact hunting is a jailable offense. There are no signs or fences to warn where site property ends and private property begins. Trespassing is a crime and there are a handful of neighbors who will shoot first and ask later. 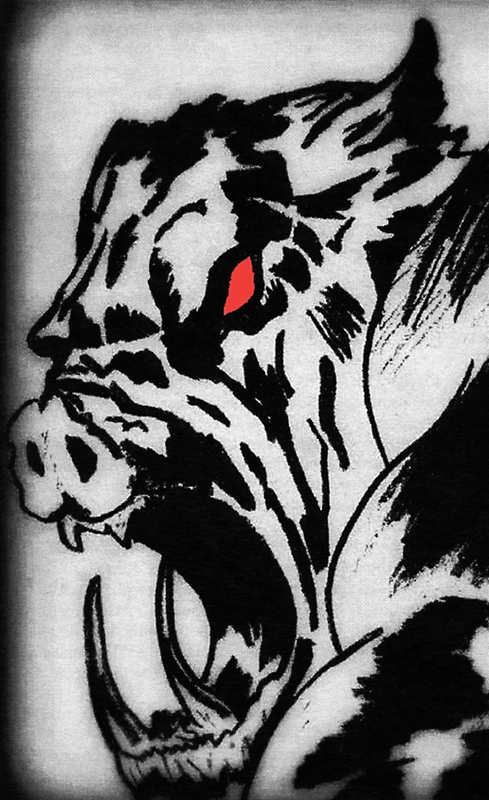 If you choose to visit Hogscald, keep your visit to the scalds or near the main road. Take photos only. All photo credits courtesy of Lance Estep, Springfield, Missouri. 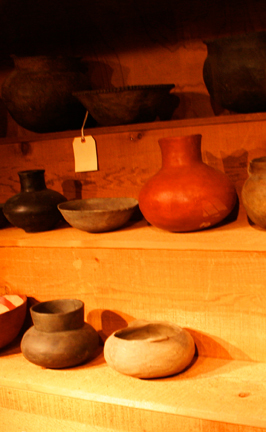 Mississippian pottery collected by College of the Ozarks archaeology students — and on display in the Ralph Foster Museum — present a mysterious image, hinting of past, unknown ages. 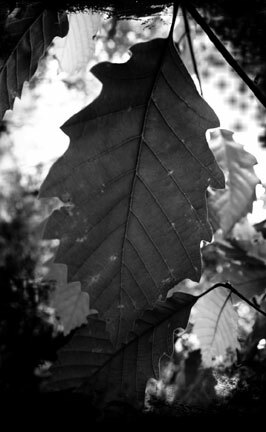 Photo by Joshua Heston. The Osage, Cherokee, Quapaw and Caddo called them the Ancient Ones. In the Woodland period (1000 BC to AD 1000), they used atlatls to hunt massive animals. By the Mississippian period (AD 800 to 1600), these groups became more settled but developed complex trade routes. We know they made huge canoes to transport chert, beaver pelts, deer hides, bear skins, bear grease and oil, panther teeth and claws, feathers, local herbs, dried meats and tusks. Thus they were called “Strong Boat Indians” by turn-of-the-century ethnographers. They followed the White River from its source in the Boston Mountains up through Missouri, then back into Arkansas to the mighty Mississippi — and as far south as the Gulf of Mexico — to trade with other Mississippian cultures. After the passing of thousands of years, these paleo-people vanished as mysteriously as they arrived. 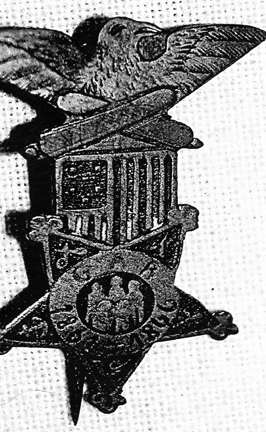 Grand Army of the Republic (GAR). “They didn't have purple hearts in the Civil War so a medal with your years of service was issued to survivors,” notes Estep. “Honor the Noble Dead.” Image courtesy of Lance Estep.